Hi all! Winterlude is sitting out yet another Norther at El Bight, Guanaja the easternmost of the Bay Islands of Honduras. Cruising revolves around the weather and in particular Northers coming off the Texas coast into the NW Caribbean this year it seems they show up regularly with a week of perfect weather between. This is a fast-moving one with very little rain. Today, snug at anchor in El Bight, Guanaja, BIG gusts funnel over the lush green mountains and explode into giant catspaws over the anchorage much like Hueston Woods on MEGA-steroids! Briefly the howl of the wind goes calm as the boat swings directly into the wind. Then as another gust hits, the boat heels sharply momentarily as it starts a swing and the wind generator goes into helicopter takeoff mode! The noise is deafening & it truly sounds like a helicopter is taking off the back of the boat as the wind generator goes into freespin. The good news is that the battery banks are fully topped off & the wind generator amp overflow is heating water so I'll have a hot shower inside tonight in contrast to our usual solar shower in the cockpit. Winds are gusting 25-30, with momentary pauses of 5-8 mph! Doesn't that remind you of the Redskin Regatta at Hueston Woods, OH in May??? One of the fun things about cruising is that you never know when you wake up what a day will hold! Days are never alike & that's one of the best parts! Some days hold challenges & some hold just plain fun, but all are different! Guanaja Waterfall Hike - A Highlight! Since our last update, we made easting to Guanaja with the trades blowing from the East or Northeast, it's difficult to get east to visit Guanaja, accounting for its unspoiled character no tourism & limited numbers of cruising sailboats compared to the other Bay Islands. The day after we arrived, we were invited on a journey through the canal that splits the island in half to the north side to hike to the waterfall in the mountains. We climbed two hours through the jungle directly up a mountain streambed to reach a gorgeous double waterfall. The climb was not what I would call hiking, more a combination of rock climbing & water wading! The payoff was a refreshing chilly gurgling mountain waterfall with plenty of room for all to swim you could even sit behind the waterfall & look out. After enjoying our trusty PB&J's for lunch, we began the two hour trek back to the beach & the panga to bring us back to the boat. New Year's Eve's Eve, all the cruisers in the anchorage all 13 boats were invited to a potluck dinner at a local house halfway up the mountain. Most houses here have names & this one is Lighthouse, a BEAUTIFUL 3 story yellow house with a huge deck overlooking the anchorage. We chowed down on a traditional holiday turkey dinner with all the trimmings. Like most gatherings of sailors, the camaraderie was a highlight. A great time was had by all until one of the sailboats broke loose & careened across the anchorage then there was a lot of scrambling down the mountain for dinghies to rescue the boat all's well but everyone spent the rest of the late afternoon/evening aboard to make sure none of the OTHER boats broke loose! New Year's Day we took our own dinghy through the canal, about 9 miles round trip in an 8 foot dinghy! The south side of the island was rocking with the tradewinds which blow non-stop 15-20+, but the north side was completely calm and amazingly tranquil we snorkeled around a place called Michael's Rock where we hope to go anchor in the right weather conditions when some other boats catch up with us we don't want to do it by ourselves! This side of the island is where Columbus landed on Guanaja in 1504 on his 4th trip to the new world it's amazing he could find his way in the break in the reef with all the modern electronics & waypoints from cruisers that have gone before, we're still reluctant to do it by ourselves!!! On our way back from the north side, we passed BoneccaTown, a small cay, just off the main island where 80% of the island's population (8,000) resides. It's been called the Venice of the Bay Islands because there are no streets, just brightly painted houses built on stilts with waterways running between for easy access to your panga via the "driveway"! As we passed the municipal dock, literally hundreds of kids ran down the dock & jumped into the water fully clothed- screaming as if the devil himself was chasing them. Turns out he was! An older boy dressed in a costume called junkanoo chased them all off the dock & into the water! We were later told it's all in fun part of their tradition, but very strange! January 2nd, was our 1st anniversary & we sailed out to Josh's Cay to celebrate at Graham's Place. Everything about Graham is colorful, from his language to the mariachi band he brought in for 3 days at New Year's, to the brightly painted palm tree trunks all over the powdered sand island (amongst the blue, pink & purple painted buildings). This island is 6 acres of 70 foot high swaying palms complete with a menagerie of Graham's "pets" dozens of conch, lobsters, 10 BIG sea turtles, a hundred lb plus jewfish, two bi-lingual green parrots, a scarlet macaw and cooing doves. Despite the possibilities for self-sufficiency, Graham won't let anyone eat any of his pets, therefore the restaurant doesn't always have food. Flexibility is all important here! We had hoped for our anniversary dinner, to dine on the beach, but there were too many unexpected visitors at lunch and Reggie, the chef, ran out of food! He promised to go to the "mainland" i.e. the island of Guanaja get fresh food & be back to prepare dinner, but as the afternoon waned, no Reggie, so we enjoyed dancing barefoot to the music, swam off the perfect crescent beach & headed back to the boat to grill fresh hogfish and gorge ourselves on Virginia's Hot Fudge Pudding Cake! For the past 2 ½ weeks, every morning on the NW Caribbean Net (SSB), all the boaters have been following the adventures of a boat named WindBird a singlehand female with two macaws sailing from Colon, Panama to the Rio Dulce. She's had every imaginable difficulty & so far had managed to jerry rig & keep her boat running despite difficulties that might have discouraged a less determined individual. However, just outside Guanaja, her luck ran out as the wind completely died 23 miles from the island with this Norther forecast for the next day. Did I mention her engine conked out, her tiller's broken twice, the transmission is faulty & she has no way to charge her batteries? Bottom line, she can't get here from there. So a local, Jack & David (as in Irons) volunteer to go rescue WindBird, a 37 foot sailboat, in Jack's 21 foot panga with a 115 hp Honda outboard. Long story short, 7 hours later, they towed WindBird in through the reef and promptly ran out of gasoline! That's 7 hours east into the Caribbean swells out 23 miles from shore (Dave & Carolyn, there were mini-elephants on the horizon)! The Honda quit running 3 miles from rendezvousing with WindBird. Briefly David had visions of being the next victims of the Norther. Luckily, they got the engine running again & despite the passing shrimp boat thinking they were out there for a drug drop, they hooked up a bridle to tow WindBird. And once through the reef, the extra jerry can of gas allowed them to make it the last two miles. As of this morning, Diana has the engine running again (by herself!) and as soon as Jack gets her new tiller finished, she'll be sailing on to the Rio where she has a job waiting. 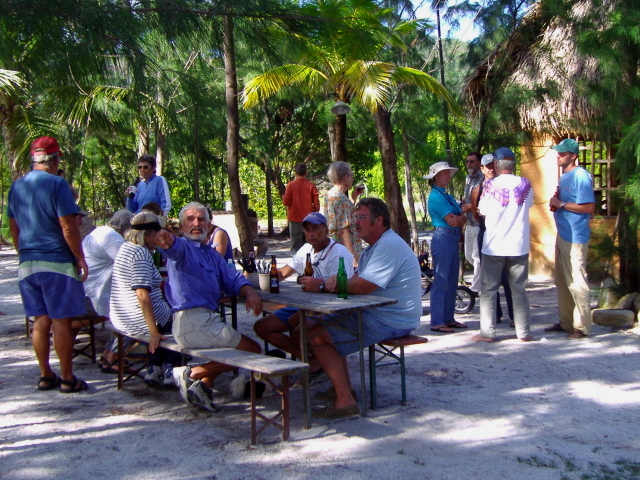 This afternoon despite the howling wind, one of the other boats in the anchorage decided that we should all go in to Hans place a hidden away restaurant on the beach that only serves food on Saturday afternoon & enjoy traditional german cooking. YUM! For $5 US each, we had a plate of food with a huge slab of pork, sauerkraut with bayberries (did you know you have to have fresh bayberries with sauerkraut to give it the right flavor?) and a boiled potato all cooked over an open wood fire! There weren't enough plates, so as the first diners finished, Hans collected plates, washed them all & served the second group. 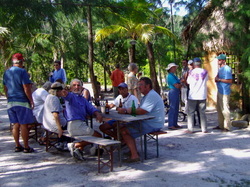 Plus there was a "full service" bar you could have anything you wanted, as long as it was cold beer or rum & coke! As the sun sets on yet another glorious day in Guanaja, the crew on Winterlude is back aboard, waiting to see what tomorrow will bring!